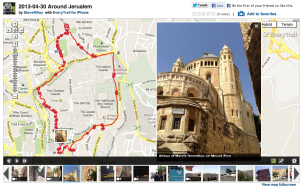 Today I took off in 90+ temperatures to get some exercise and to share the Old City of Jerusalem with all of you. I took a little different course than usual to provide new pictures and videos. I also tried to capture pictures of interesting people. I don’t walk up and click my iPhone in their face or ask permission to take a picture because most would say NO. So I clandestinely take pictures as I go along. I also try to point out the holy sites from both Old and New Testaments. Many people will never be able to visit the Holy Land so I try to bring it to you in as many ways as I can. I want Catholic to know it is TRUE enough to live for it, and even to die for it. My whole body wants to take off running like in the past but my knees just won’t do it any more and two knee specialists have now told me I have to walk, bike and use other means of exercise and discovery other than running. I plan to buy a mountain bike here in Israel to use when I am here. Anyway, enjoy pictures, commentary, videos and interactive map. Click on the image to join the learning adventure! Support an Archbishop Attacked by Half Naked Lesbians Mocking the Blessed Virgin – and they say we are not tolerant! Over 17,000 people have signed our Open Letter to Archbishop Leonard thanking him for his humility and grace when half-naked feminists shouted obscenities and doused him with water while mocking the Blessed Mother. Can we include your name in support of Archbishop Leonard? We have received word that the Archbishop of Brussels is aware of our effort and is grateful. Equally important, other bishops and priests are watching to see how the laity respond to these attempts to silence our clergy. We plan to deliver our Open Letter to Archbishop Leonard later this week. We want to overwhelm him with prayers and support. That’s why we would like to include your name, too. Sign our Open Letter of Support for Archbishop Leonard! Jackie’s Story: Why She Missed Running the Boston Marathon this Year; Why She Runs… Not a Dry Eye on the Bus! Jackie was one of our pilgrims on this trip to the Holy Land. She is a marathon runner who’s achieved great success. Even while here she would arise early and run several times around the Wall of Jerusalem. Deacon Jim was also on our trip along with his wife and daughter. He is struggling with serious stage 4 cancer. He was a trooper the whole way and never once complained. He served at Mass and struggled but never fell behind. Jackie has run thirty-one marathons, seven of them Boston Marathons. But she missed the Boston Marathon this year and I’ll let her tell you why. Why is the number 7 so important to her. What makes her run? Deacon Jim did not expect Jackie’s announcement – none of us did, but we were all stunned and moved to tears. Why will Jackie run the Boston Marathon next year? I think you will enjoy her story which she shared with us on the bus yesterday. There was not a dry eye on the bus and no one spoke for a long time. This is one incredible lady! As many of you know, Andrew and I went with my parents on a Holy Lands pilgrimage in April. It was a unique and fascinating experience. From the Christian perspective, I would strongly recommend our tour host, Steve Ray (and his wife Janet) https://www.catholicconvert.com/ . His (and her) knowledge of both Testaments of the Bible and the Holy Lands itself is stunning, and he conveys it to the group in a way that is easily understood and appreciated. I have attached photos from 2 places that I felt were quite powerful. The first is from within the Church of the Holy Sepulcher in the walled Old City of Jerusalem, and marks the spot where Mary stood during the Crucifixion. The second is within the Church of all Nations, and is the stone upon which Christ began His passion in the Garden of Gethsemane on Holy Thursday. We have been back for about 2 weeks now, and everything we experienced is still filtering in. God willing, Andrew and I have increased our commitment to each other, and hope to be better neighbors to everyone else as well. Boat Ride to Mass at Capernaum, Eating St. Peter’s Fish, Up to Jerusalem!